Prepare a hot grill fire. Thread zucchini, tomatoes, onion, and halloumi onto skewers, brush with 2 tablespoons oil, and sprinkle with ½ teaspoon salt and pepper. Grill, turning frequently, until browned and tender. 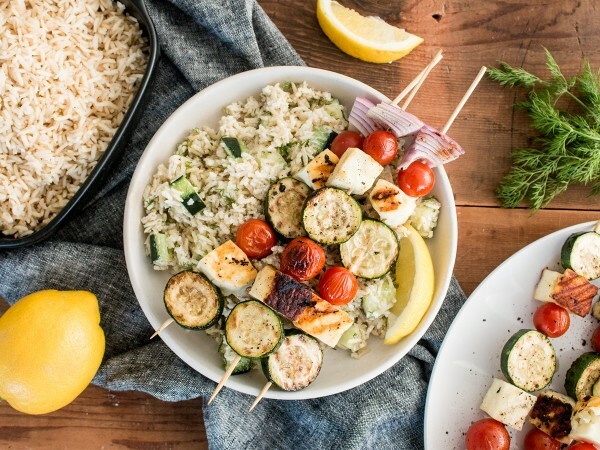 Toss cooked rice with cucumber, yogurt, lemon juice, dill, 1 tablespoon oil, ½ teaspoon salt, and garlic, and top with grilled vegetables.